Digital PS4 version reviewed. Review copy was provided by the publisher. 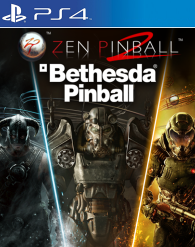 The 'Bethesda Pinball' three table pack, like other 'Zen Pinball 2' tables, is cross buy on the PS4, PS3, and Vita. 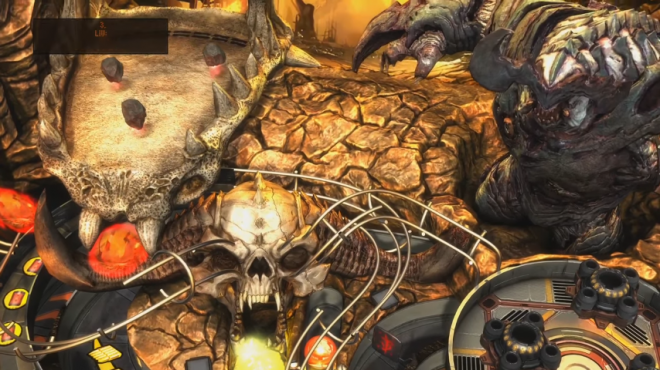 Bethesda has teamed up with indie developer Zen Studios to bring three of their most iconic franchises to 'Zen Pinball' and 'Pinball FX.' The three games to receive the virtual pinball machine treatment are 'Fallout 4,' 'DOOM,' and 'The Elder Scrolls V: Skyrim.' These tables aren't available à la carte, and must be purchased as part of the 'Bethesda Pinball' pack. It's familiar territory for Zen Studios to be working with established franchises, as they've worked with 'Star Wars' and 'Marvel' in the past. 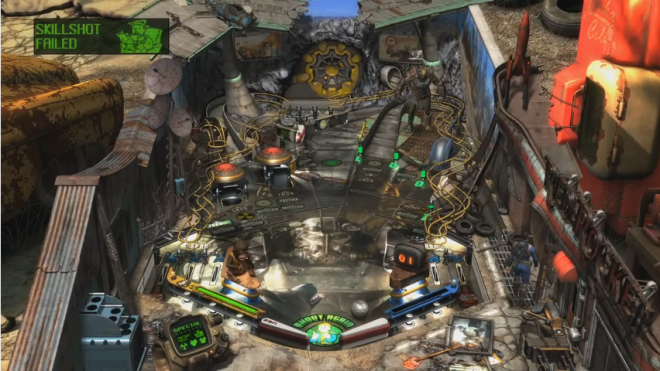 These have proved to be successful both critically and commercially, as the studio has shown an ability to create a fun, accessible game of pinball while also respecting the source material. That's exactly why I was thrilled to check out 'Bethesda Pinball,' the studio adaptation of Bethesda's three most popular franchises into pinball tables. The first table that I checked out was 'DOOM,' and it was definitely my favorite of the bunch. The table is filled with different ramps and lanes to shoot, and is just a joy to play. Immediately I was setting up shots, triggering missions that would spawn demons onto the playfield that I would have to shoot, and then collecting various weapons that the Doomguy would use to shoot down foes that would appear. The weapons are one of the several things unique about the table, and players can actually bring up a weapon wheel to switch between them. It features the same slow-down effect as this year's first-person shooter, which is great from both a visual and gameplay standpoint. There were several moments where I'd switch weapons just in time to hit the ball with one of the bumpers, and it always felt extremely satisfying. There are also plenty of power-ups that can be collected such as the "Quad Damage" one that helped me obliterate my previous high-score by giving me a massive multiplier. The table nails the attitude of 'DOOM,' and brilliantly applies it to pinball. 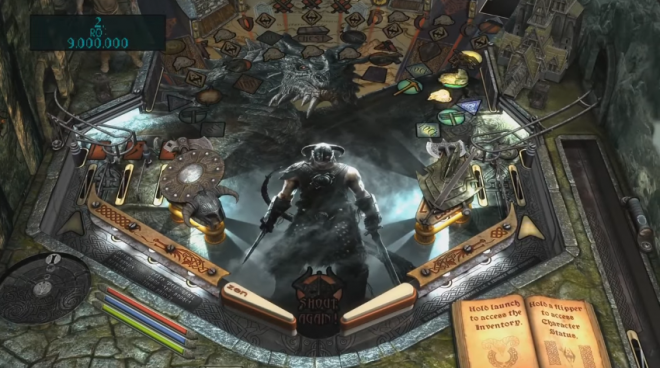 While the 'DOOM' table ranks as one of my favorite pinball cabinets that 'Zen Pinball' has ever offered, the same can't be said for 'Skyrim.' It's not a bad table by any means, but I'm not really a fan of how Zen Studios have implemented the signature 'Elder Scrolls' mechanics into the game. The core hook here is that the table functions as a role-playing game. That means the players is leveling up, going into shops and even equipping different weapons & armor. This leads to a lot of time being spent in clunky menus that are operated with the two bumpers and the ball launcher. This is a terrible way to navigate anything, let alone pages of store text. I really don't get why the store didn't use all of the controller's buttons and operated normally. It's not exactly trying to be a table that could be replicated at a real arcade, so I don't get why Zen Studios wouldn't further embrace the virtual aspect of the table. It's okay for a dragon to fly around and spit fire all around the table, but the player must hold both bumpers if they want to back out of a menu. It's a strange place to draw the line, and it's just one of the many things I didn't dig about the table. The 'Fallout' table is very similar to the 'Elder Scrolls' one, and even has players customizing a character's stats at the beginning of each game. There's a lot to manage here, as players have to watch a radiation level that impact's the score, and have to spend caps to upgrade items. The actual course is pretty fun to shoot around as it features some really enjoyable ramps, but the whole progression system makes it feel like a drag to play. I eventually stopped caring about the role-playing elements and just treated it like a normal table, and it was then that I finally had some fun with the table (even if that doesn't lead to optimal scores). If anything, 'Bethesda Pinball' seems to be overly ambitious. The ideas are all sound on paper, but fail to captivate in execution. It doesn't help that some of the features, such as the 'Skyrim' table featuring progress that carries over from game to game, don't jive with the existing package that Zen Studios has created. It's an idea that I'd love to see fleshed out in a full game based upon the idea, but it just feels shoehorned in here. It all comes down to what players value when they come to a virtual pinball game. As someone who loves to play a quick round of pinball, and try to grab a high-score, I think it's pretty ridiculous to have to dig through a series of menus while trying to play. Others may find the additional layer of depth refreshing, but it just got in the way of my enjoyment. That said, even if I didn't particularly enjoy these choices, they are true to the source material, and I am glad that Zen Studios is willing to experiment with what works. Sound design is another strong area as sound effects from the games are re-used here to good effect. Using the BFG on the 'DOOM' table is highly satisfying just like in the shooter, and hearing the chainsaw revving up every time the player launches the ball is awesome. Each table is treated with care, and the only complaint I have is that there isn't more music from the games. 'DOOM' and 'Skyrim' have especially memorable soundtracks, so it's disappointing that there's not a wide range of tracks that play. In fact, one of my longest 'DOOM' runs had the music end and then I was just left with ambient noise. It really kills the rocking vibe that the table started off with, and it's disappointing that more tracks weren't licensed all around. I know I'll be coming back to the 'DOOM' table for months, but I'm not sure I'll be playing much of 'Fallout' or 'Skyrim.' There's really no point to play a merely good or passable table when 'Zen Pinball 2' is filled with dozens of great ones. Still, those that only have access to this add-on will find reasons to come back (especially with 'Skyrim's progression system), even if I won't be spending much time here. 'Bethesda Pinball' is easily Zen Studios' most ambitious project yet. They really went all out making sure each table feels like the game it's based upon, but that leads to mixed results when it comes to digital pinball. 'DOOM' is the real standout addition, with the two role-playing game tables getting too overly complicated. While it may not pull off every idea it attempted, I'm glad that Zen Studios isn't afraid to take risks, and that's exactly why this is still a pinball pack that is worth checking out even if it's not the developer's best adaptation.